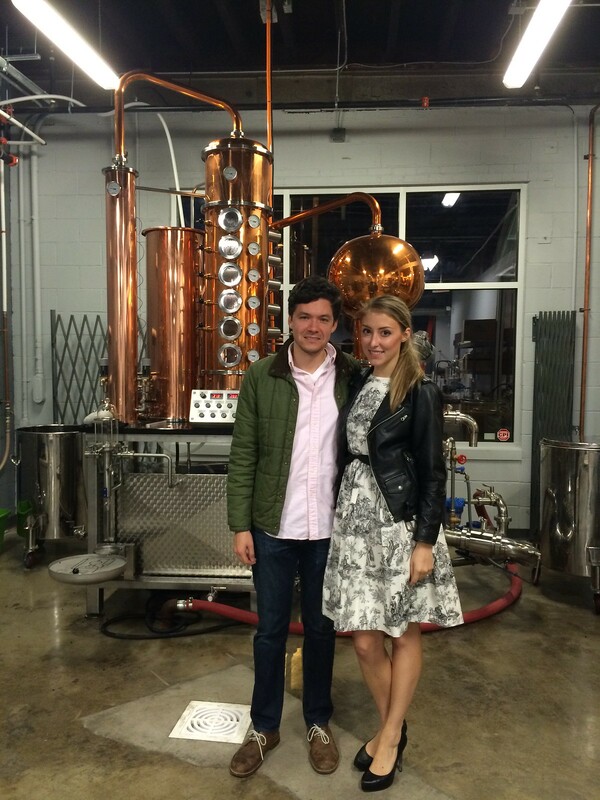 Alex and I visited a cool new spot downtown this weekend: Durham Distillery. I wore my skeleton dress, which I still adore. I haven't been doing a lot of, like, quilting cotton sundress-type sewing recently, since I've been trying to stretch myself, but I do love a good cotton day dress, and I have a few lengths in my stash waiting for warmer days. Even though I made this dress three years ago from a totally ridiculous pattern with hacked on sleeves and skirt, I do think the fit is decent, and my only complaint is my range of motion in the arms is limited. If all you plan to do is drink gin, however, they're perfect! We have gone on our fair share of brewery tours, but this was my first time visiting a distillery, and I was very impressed! Although small (they just opened a few months ago), the distillery was lovely. We got a tour with a tasting of their two gins and three liqueurs from the owner herself. She mentioned that they might expand their line to include a bourbon (after all, we're in the South) but for now, the focus is on gin, and they have two different styles, the American Dry and the Navy Strength (114 proof to the American Dry's 88, and with a different flavor profile). 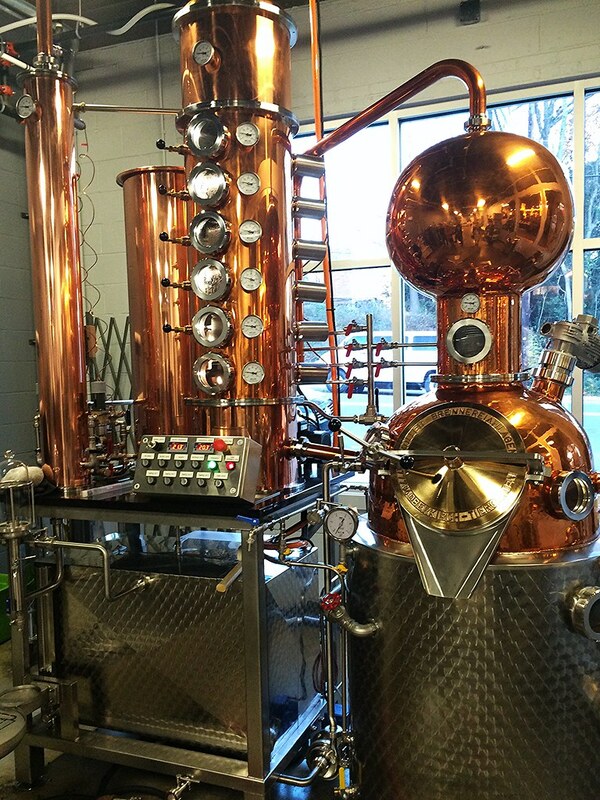 The distillery has two main contraptions used in their gin making, the first of which is this drop dead gorgeous copper still, which has a stainless steel tray that holds the hardier flavorings (juniper, cardamom, coriander, etc.). The second is this much less steampunk vacuum machine (modeled here by owner Melissa), with which they infuse the neutral spirits. The more delicate flavorings (cucumber, honeysuckle(!! ), mission figs, etc.) get this treatment since there is no heat involved. 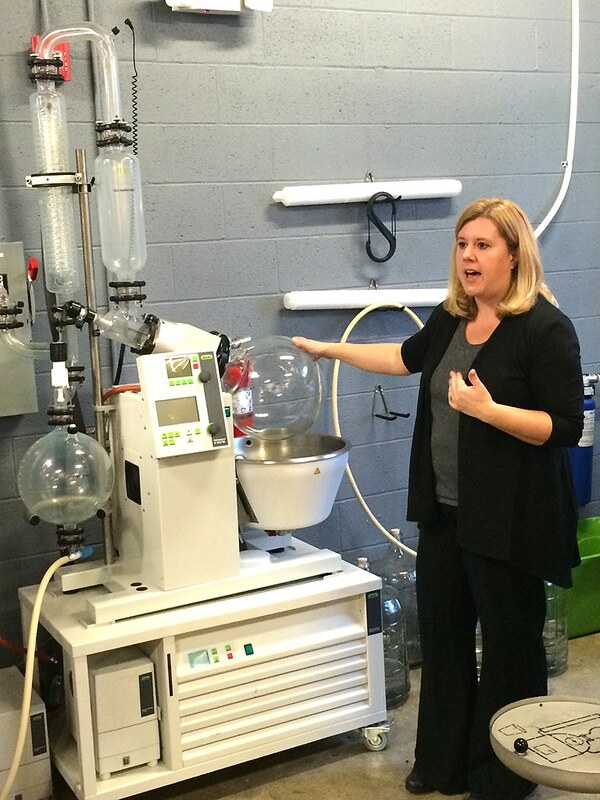 This is not typical equipment for a distillery--Melissa's co-owner and husband is a pharmaceutical chemist, and this technique is 100% science lab. Then the products of the two machines are blended together to get just the right balance before being bottled up. I don't know that much about gin. I thought our samples were tasty, although I really can't say I've ever sipped on gin neat--I prefer a G&T or a little St-Germain cocktail (St-Germain, gin, sparkling white wine, soda water). 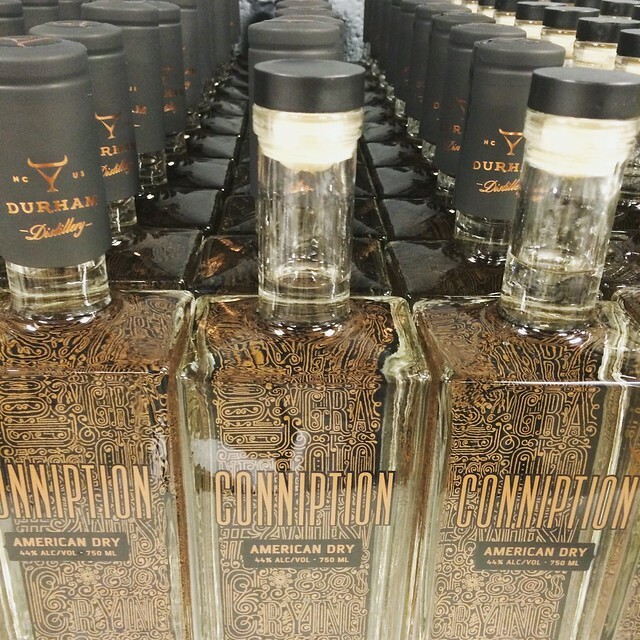 What I can attest to is the owners' devotion to Durham's local scene: North Carolina has strict rules when it comes to distilling spirits. Local distilleries just recently lobbied for a rule that would allow them to sell one bottle per person per year to people who visit, and that was considered quite a success (before this law, people going on tours would then have to visit their local government-controlled liquor store to purchase a bottle). It would have been much easier for Durham Distillery to set up shop somewhere that was, well, not Durham, but as they mention on the website, they're "right at home" here. And I, for one, am glad! This dress is almost three years old, which seems wild to me. 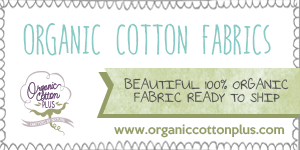 I feel like my handmade clothing, at least at this stage in my sewing career, have about a two-year lifespan before I just can't handle the fitting/sewing issues, with some exceptions. Presumably, this length of time will increase as I improve! Since I've been thinking about my photography, I think I also feel similarly about my blog pictures, actually. What do you think? Are you at a point where your clothes physically wear out before your increased skills make them "unwearable" in your mind? ps: i bought myself a new camera on cyber monday, and put my memory card in it, then hedged and decided to bring my old camera with me since i'm still learning how to use the new one. you may have noticed i didn't mention putting the memory card back in my old sony... so, sorry for the iphone pictures! ugh.